(From left) Personal protective clothing, station wear options, ceremonial wear and corporate wear. LONDON — Today sees the start of a roll out of new uniform for the Fire and Rescue Service that has been specifically designed for a modern diverse workforce. Until now the protective clothing and uniforms available for women firefighters have often been an adapted version of the men's. Better fitting protective clothing means that the firefighter is better protected. Better fitting corporate and station uniforms look more professional. The range of clothing available now available includes personal protective clothing for use when attending fires and other incidents including boots, gloves and helmets; corporate and station uniforms — for public events and visiting people at home or business to advise on fire prevention; sports wear; and maternity wear. In the long term the new colour of the uniform — grey with red — has the potential to give the Fire and Rescue Service (FRS) an easily recognisable national identity, which they do not have at present. The new clothing, covering all aspects of a firefighter's working day, has been subject to rigorous testing by volunteers from FRS from all over the country. Communities and Local Government helped fund the garment testing, as part of its investment to ensure the modern FRS has the equipment it needs for the challenges of today's world. A key aim in developing the various clothing options is to encourage the widest possible range of people to consider a career in the Fire and Rescue Service. The testing was designed to identify the physiological impact and to ensure that the items worked when worn together. Fire Minister Sadiq Khan said, "We want the widest range of applicants to apply to join the Fire and Rescue Service. To do achieve this it is important that all applicants — men and women — know that the uniform and clothing they will be issued with, will not only protect them but will also fit properly and be comfortable. The introduction of more appropriately fitted clothing is just one initiative to help to both retain female firefighters and encourage others to consider a fire service career. "Fire prevention is vitally important today as we continue the aim of driving down fire deaths. To achieve this, the FRS needs employees from all ethnic groups to reflect the diversity of our communities. This will enable better mutual understanding when the FRS undertake fire safety visits. The uniform now available shows that cultural beliefs are being recognised, as we seek to increase the representation of ethnic minorities within service. "We ask a great deal of our firefighters every day, and their professionalism was again called upon in the testing. I want to thank all who were involved in the rigorous trials and tendering process." The extensive testing included ergonomic and physiological impacts when undertaking realistic scenarios. Eight women and eight men volunteered and many FRS provided observers for the trials at the Health and Safety Laboratory in Buxton. Tests included flame engulfment. The trials, which required the volunteers to carry out the normal moves of a firefighter, monitored the effects of the protective clothing to ensure that they did not become overheated and unwell and that the clothing was practical. The trials in the thermal chamber included monitoring firefighters core body temperatures; monitoring how much water firefighters needed to drink to keep hydrated; weighing the 16 volunteer firefighters and the clothing before and after the tests to measure how much sweat they produced; and firefighters were timed picking up small objects and tying knots to see how easily they could carry out awkward tasks whilst wearing protective gloves. Jagtar Singh OBE national spokesperson for the Asian Fire Service Association commented, "AFSA are pleased to note that the Fire Service is now taking seriously the issues of culture and religious belief when purchasing corporate and protective clothing for firefighters. This can only help to support the service to recruit more BME men and women." Nicola Lown from Gloucestershire Fire and Rescue Service said, "The uniform was comfortable in its entirety and the trousers, for once, fitted well!" 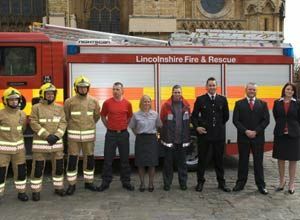 Lincolnshire FRS is the first to purchase the clothing. Lincolnshire's Chief Fire Officer Mike Thomas said "Having been involved in the development of this clothing project I have been particularly impressed with the robust and extensive garment trials and the development of the national identity. I look forward to seeing my operational firefighters protected to the best standards available with clothing that is clearly fit for purpose, suitable for all staff. The clothing presents a positive image of the modern fire and rescue service." Fire and Rescue Services now have the opportunity to order the clothing as their existing kit needs replacing. The procurement process has been managed by Firebuy Ltd, a government company that manages national procurement projects for England's Fire and Rescue Service. The successful tenderer was Bristol Uniforms Ltd.